René-Louis de Voyer de Paulmy, marquis d’Argenson (1694-1757), minister of state and author, was one of the boldest critics of the social and political structure of Old Regime France to put pen to paper in the eighteenth century. His Considérations sur le gouvernement ancien et présent de la France advanced a scathing indictment of the existing order alongside a far-reaching reform plan to spread democracy and obviate aristocracy within the monarchy. Manuscripts of the Considérations circulated clandestinely among philosophes and other political writers such as the abbé Saint-Pierre, Voltaire, and Rousseau until its posthumous publication in 1764. This is the first critical edition of d’Argenson’s Considérations, based on four different manuscripts and presented here with a selection of d’Argenson’s other political writings that have never been published. 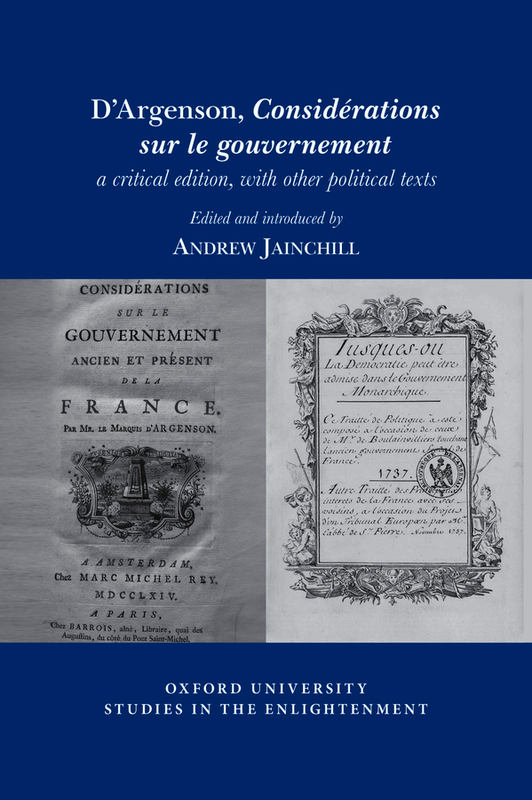 Drawing on a wide range of sources, Andrew Jainchill introduces d’Argenson’s treatise with an essay interpreting his political ideas, showing the important changes he made to the different manuscripts over the decades he worked on the text, and situating within the political and intellectual context d’Argenson’s political project to introduce democracy into absolute monarchy. Andrew Jainchill is Associate Professor of History at Queen’s University (Canada) and the author of 'Reimagining Politics after the Terror: The Republican Origins of French Liberalism' as well as articles and book chapters in a variety of venues.